As St. Thomas Aquinas High School celebrates its 83rd year, the school community harkens back to 1936 when St. Anthony School enrolled 12 high school students to initiate Catholic secondary education in Broward County. Under the aegis of the Dominican Sisters from Adrian, Michigan, and motivated by the motto, “Not for school but for life we learn,” the school grew to a student body of 42 in four years, boasting nine graduates who comprised the Class of 1940. St. Anthony High School earned its initial affiliation with the Southern Association of Colleges and Schools in 1941. Although boys’ basketball made its debut before football, the young Raiders opened their first football season in 1946. The school published its first yearbook, the 110-page Veritas, Volume 1, in 1950; and St. Anthony High School saw its last class graduate in June of 1952. The newly-named Central Catholic High School moved to its present location in 1952. The original Central Catholic campus consisted of the main office wing, library, 15 classrooms, patio, cafeteria, kitchen, coaches’ office, and locker room facilities. The school erected a statue of Mary in 1957 that still graces the campus today. In September 1961, the school chose St. Thomas Aquinas as its patron and official name. The 1970 school year welcomed Reverend Vincent T. Kelly who continues to lead the charge as Supervising Principal. 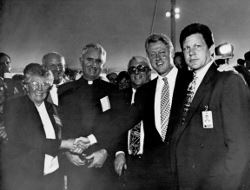 A few years later Sister John Norton joined Fr. Kelly to bring Aquinas to prominence. In 1979, Brian Piccolo Memorial Stadium welcomed fans to its inaugural football game where the Raiders beat Cardinal Gibbons. Aquinas recognized its first National Merit Scholars, with 10 finalists, qualifying by the end of the decade. Advancements in science prompted the construction of the John A. Kelly Building. The opening of The Bienes Center for the Performing Arts provided STA with a venue for showcasing school and community performances in drama, dance, art, and music. Offering quality training and competition facilities, the newly built Smith Center enhanced the entire athletic program. Recently, a surge in educational technology emerged onto the STA campus with the construction of the Innovation Center, providing teachers and students with state-of-the-art technology in the most ideal collaborative learning environments.